The supreme leader of the Evangelical Lutheran Church is Jesus Christ by whom our faith, sacraments, structures and visions dwell in him. For his name's sake ELC-PNG was established. All these three officials have to fulfill 1Tim 3:1-7. 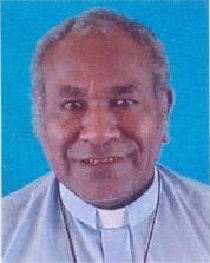 They are elected at the National Synod by the delegates from all the respective 17 respective ELC-PNG districts. Each official serves a term of four years commencing from the date when they were elected. The same person holding onto a position can only stay no longer than three consecutive terms. (a) The Head Bishop is a pastor, a teacher of the Faith of the Church and provides leadership for the life and witness of the Church. The Bishop is an ordained pastor of the Church. (b) is the overseer of the Confessions of the Church, and the ministry of God's Word and the Sacraments. (c) The Head Bishop is supported by the Bishop Advisory Committee.Members of the committee are the presidents of the 17 districts and the Church Secretary. The Secretary is a lay person who shall fulfill. He is the Head of the Administration of the Church. (a)The Assistant Bishop is a pastor of the Church. He assists the Head Bishop in the performance of the duties and responsibilities of the Bishop. (b)The Assistant Bishop will be the Acting Bishop of the Church when the Head Bishop is off duty or outside Papua New Guinea. Each of the 17 ELC-PNG District has an elected ordained pastor of the church as the District President or the District Bishop and an elected lay person as the District Secretary. The duties of the district president and the district secretary are a replica of the National Church Officials. Note that the Districts have no Assistant president. The district president and the secretary are normally elected at the District Conference and also serve a term of four years. ELC-PNG has seven departments and each of these seven departments a headed by Department Secretary. The duties of each of the department heads are something similar to a CEO of a Department in a large organisation. They oversea that each of the respective departments focuses on their goals to achieve the overall vision of ELC-PNG. Each department heads are appointed by the Nomination Committee of the Church and blessed by the National Church Council to take up the post. They serve a term of four years. The church council is the second highest decision making body of the Church. It is more like the National Executive Council of our National Government. The church council is made up of all the District President and a layperson from the each of the 17 districts. The Chairman is the Head Bishop. The Church council meeting is held twice every year unless there be need, special Church Council meetings are called.